An amazing capital city! Quito Ecuador has a wide variety of sights and activities. The city is set in a valley of the Andes mountains and surrounded by beautiful peaks. 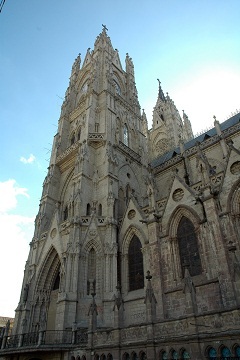 Many come to Quito to study Spanish or to see the historical places found throughout the city. 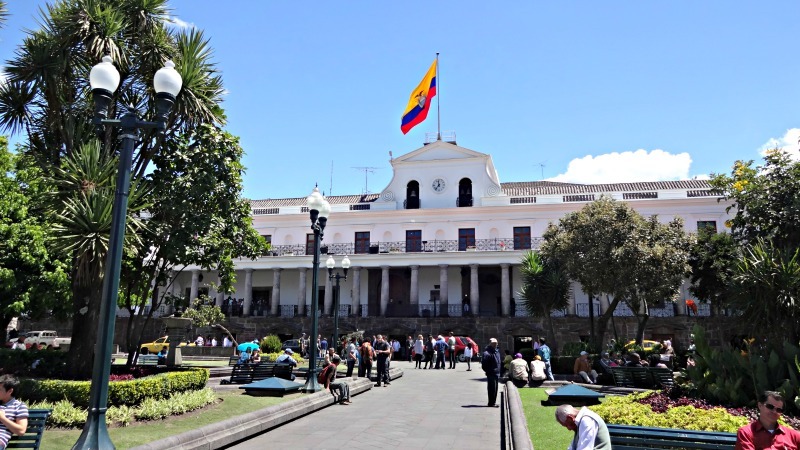 Quito is a great central starting point for touring Ecuador. 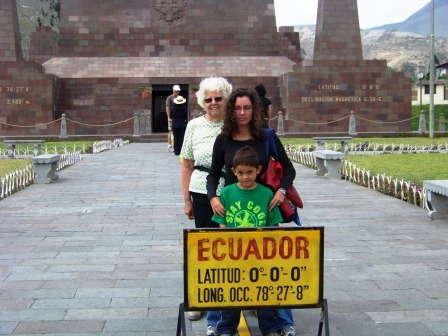 You can arrange for guided tours in Quito or travel to various places throughout the country from Quito. For those of us who live in Ecuador, Quito is a great escape is you're feeling home sick, since this city provides many modern conveniences. 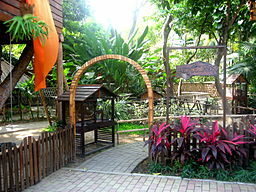 The city has many large parks for the outdoor loving Quiteños. Families gather to play soccer or volleyball. Other can be seen lounging in the sun or reading a book. Some parks transform into large outdoor markets on certain days of the week. My personal favorite is at Parque Ejido on the weekends. The parks north end fills with artists selling painting and crafts. Old town Quito Ecuador is very interesting, with historic buildings and plazas bustling with people. You can arrange for a guided walking tour or wander around on your own. Maps of Quito are available just about anywhere tourists can be found, just ask where to get one. "Lonely Planet's Ecuador & the Galapagos Islands (Country Guide)" also includes a suggested route for a self guided walking tour. We recently wandered the Plaza Grande, nearby museums and La Ronda Street in Old Town Quito Ecuador. It was a great opportunity for people watching and full of architectural beauty. See my Colonial Quito Photo Tour. 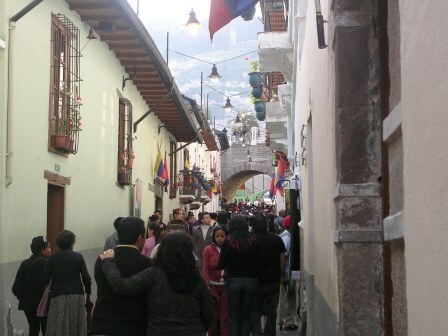 The Mariscal area of Quito has come to be known as Gringolandia. This area has many traveler friendly hotels, restaurants and gift shops. Plus bars and clubs for the nocturnal. I enjoy the areas Internet Cafes and colorful restaurants. After being in small town Ecuador for months on end the variety of restaurants can be truly refreshing. The Confederate Books bookshop can be just what an avid reader needs. There are plenty of choices for new reading material. 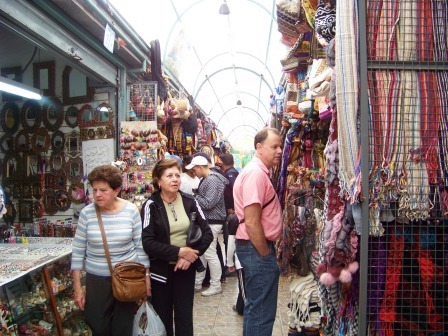 There is also a great craft market in the Mariscal. If you didn't get a chance to go to Otavalo or didn't get your fill when you were there, you can find everything you could ever want at the market here in Quito. 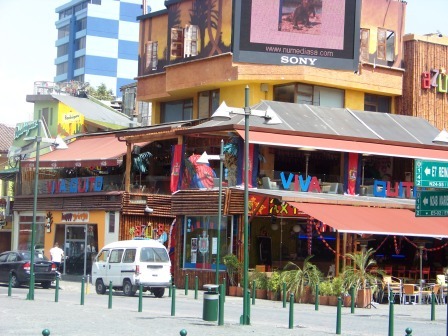 Located on Reina Victoria and Jorge Washington, the market almost fills a complete city block. 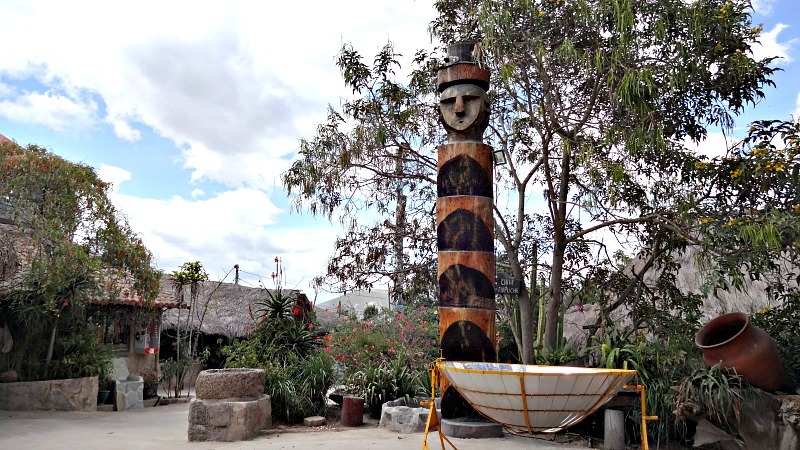 Find everything from woven and leather goods to tagua carvings and paintings. Click on the options below for info on each attraction. My biggest reason to go to Quito other than an airport pick-up, is for some necessities not so easily found in smaller towns in Ecuador. SuperMaxi is a life saver. In a country filled with small corner stores with limited choices a real supermarket is the best. You can find cheeses and peanut butter and other things from home. Fast food can also be appealing after lots of home cooked from scratch meals. McDonald's, Burger King and even TGI Fridays are found in Quito...just to name a few. Food like that tastes extra good when you're feeling a tad homesick. And the cherry on top....a newly released movie on the big screen. Quito may be a little behind on the newest movies, but after a few months in Ecuador you won't know the difference. Most movies are shown in English with Spanish subtitles. One huge exception are animated movies and anything geared toward kids. It's a good idea to ask before you go it to make sure you're going to see the movie in the language you prefer. 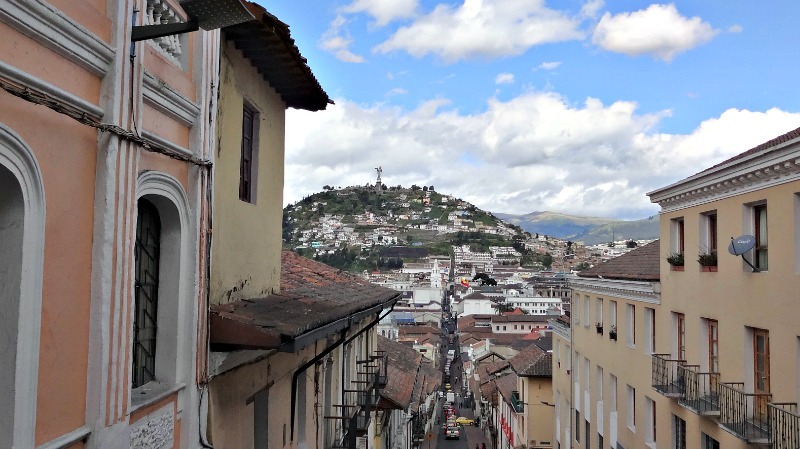 Quito is a great central location from which to travel around Ecuador. 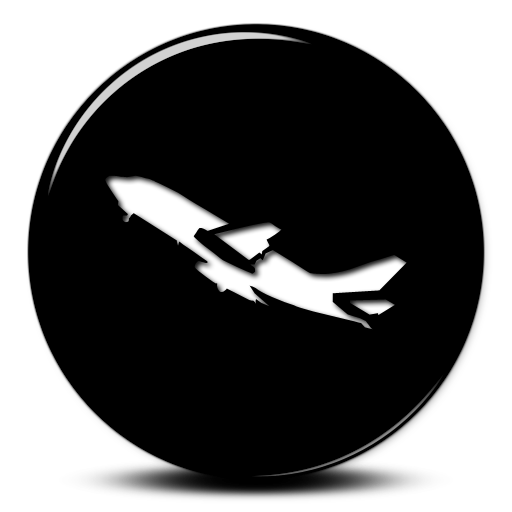 It has two big bus terminals, one in the north called Carcelen and another in the south called Quitumbe. From the Carcelen bus terminal you can travel to Otavalo and other cities north of Quito. From Quitumbe you can reach the rest of the country. The coast. The jungle. The southern mountains including Ambato, Banos, Cuenca and Loja. 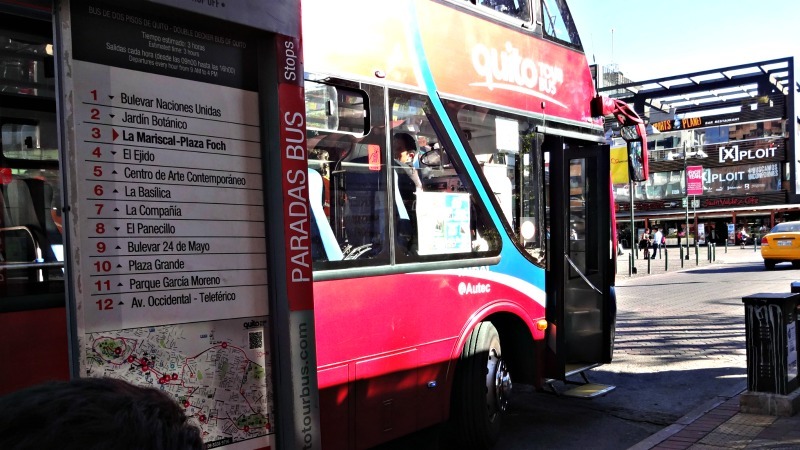 Since the terminals are at the extremities of Quito you may find yourself needing to travel from one station to the other. Insider tip: There is an express bus which travels to both terminals, stopping only at the Parque Ejido to pick up passengers. The bus costs 50 cents, which is a huge savings over taking a cab. Quito, like any other large city, can be dangerous. Please be careful when wandering the streets. Pickpockets are common...with cell phones often being the biggest target. Watch your stuff especially on crowded public transportation. Also watch the traffic...crazy drivers are everywhere and pedestrians don't have the right of way (by law probably we do, but drivers don't tend to respect that). Follow Life in Ecuador's board Quito Ecuador on Pinterest.